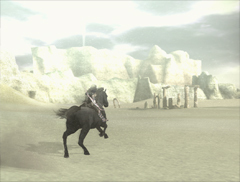 And again your journey leads you to the southwestern end of the plateau the temple is on. 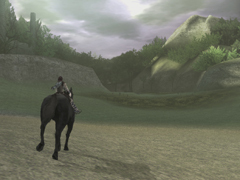 Just like on your way to the 6th colossus you enter the forest here and ride through it in northwestern direction. There you take the small path through the valley to enter the huge plain in the south(west) of the land. 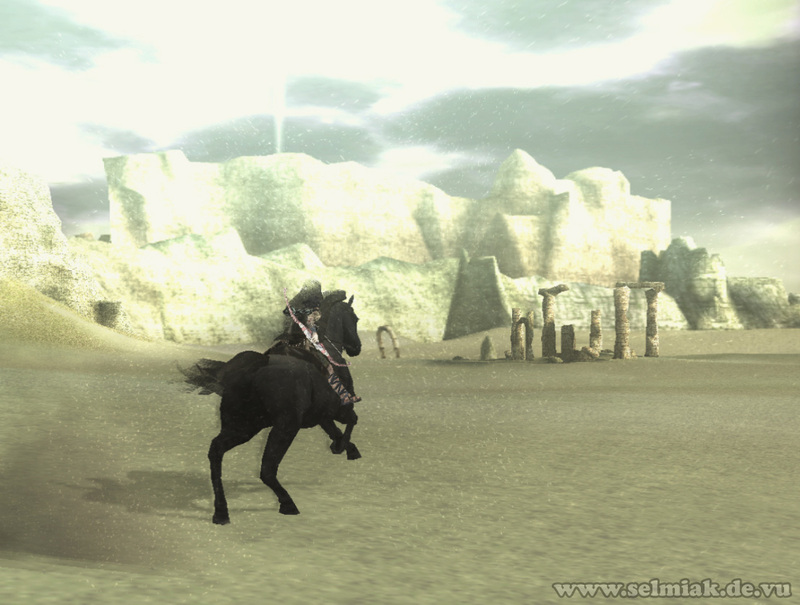 You ride over the plain and wide field through the burning sun in southern direction until you find a circular temple ruin in the middle of the plain. Whatever rituals were held here they were of no good. And as soon as you step inside the old ruin all hell breaks loose as the 13th colossus enters the arena from below. 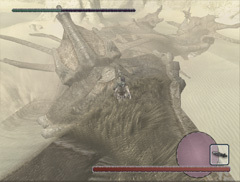 If you want you can save before fighting this colossus at the saveshrine in the north of the desert plain. This colossus is a nice and fair guy as he doesn't attack you once he hatched out of the sand but he rather prefers to fly along through the hot desert sun over your head. 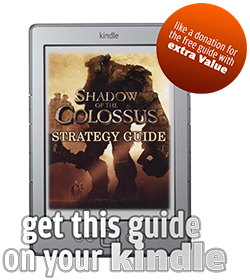 So you don't have to worry about the colossus attacking you at this time. 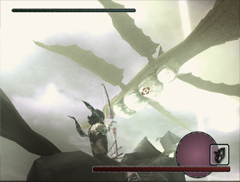 But there is one inevitable question, that is, how do you win a fight against a huge colossus that is flying some hundred meters above the ground? And how do you get onto the colossus in the first place? Your first task at this bossfight is to destroy all the floating bubble tanks of your new enemy. The thirteenth colossus features three of these babies. They are spread all over his underside and look like colossal ugly blisters or white plastic bags filled with old air and tied there with ropes. You have to attack these three floating tanks with an arrow each. 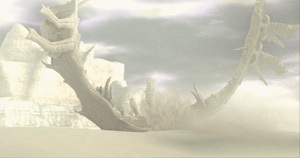 Once they are all broken the music will change and the 13th colossus will lose an enormous amount of his height so that his crusty wings will touch the ground and a lot of dust flies through the air. And exactly these wings are the secret. You can climb up on his wings. 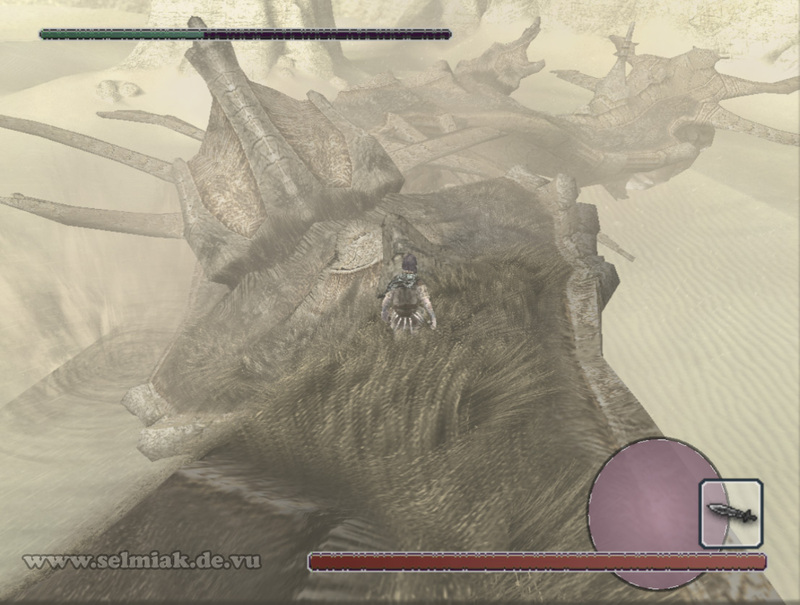 To do so ride along with the colossus and keep some distance or otherwise the dust might get in your eyes and you can't see anything anymore. As soon as you are at the front fins get close to one of these fins and then jump over from Agro to this fin and grab onto it. This might take some tries, just try often enough. Now you can climb up the steps on the wing, if you have to you can correct your position by climbing along the step towards the head of the colossus because otherwise the strong wind can blow you off from the wing. 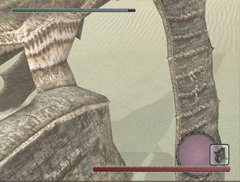 Climb up so that you are hanging from the last step, not the edge of the fin. Because now the colossus will rise again and just starts to flap his wings. It is is a lot easier to hold on to the thirteenth colossus rising when you are still on top of the fin and not hanging down from the outer end of the fin. 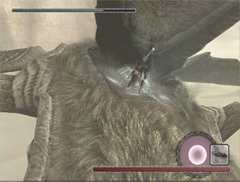 As soon as the 13th colossus stopped flapping with his wings you can stand up safely and jump onto his body. Here the wind blowing in your face is not that mean anymore and not as mean as on the 5th colossus, so you can just walk towards the tail end of the colossus. 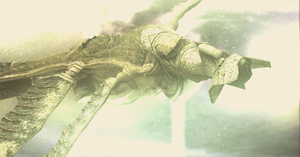 Here you will come across three gill like structures which cover the weak points of the 13th colossus. The first weak point is very close to the front wings you just climbed up. So get yourself behind this thing and strike your sword into the glowing ornament. After draining about one third of his health the colossus will perform a really nice barrel roll and shut down the gill. Now it's getting interesting. 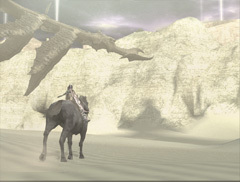 The colossus dives down into the sand in the desert. So you better jump off shortly before hitting the ground. Good timing is very helpful here. After some time hanging around under ground the thirteenth colossus reappears on the scene and is repimped and pumped again. So you have to shoot his swollen blisters again and then of course climb on him again to take out another weak point until he dives down again. After this you pop open his blisters one more time and also climb on him and finish him off. So you have to climb on him three times but this should be no problem for you but rather a fun activity. While the colossus is under the sand you can follow it with the reflected sunrays from your sword or log onto the colossus with and thus estimate where it will resurface but it works better with the sword and is also a lot more stylish.